With Good Friday being April 18 the market is open 4 days this week. Basically this past week I was right in concluding the 4 month cycle was dominant and SnP500 was down just under 3%. R2K is now down almost 8% for the year (so keep your eye on this as it and the NAZ led up and now may be leading down. 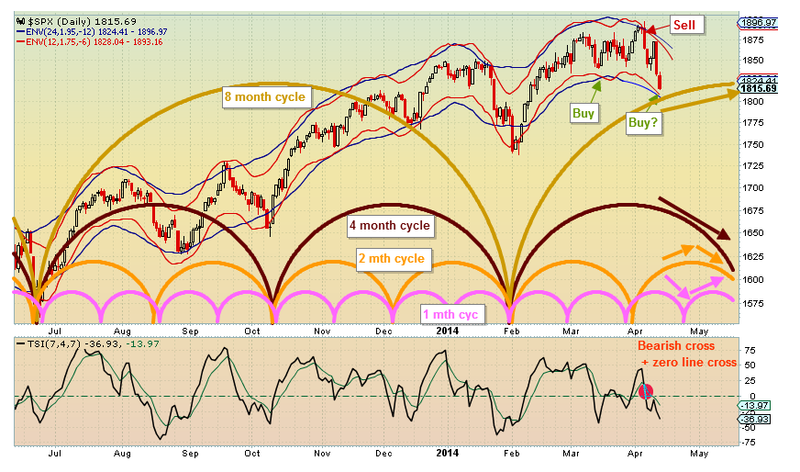 The 2 month cycle should top (providing some upside push first 2 days), The four month and one month cycles are down, while the eight month cycle is up. So we may get an attempt to rally Mon-Tue, but I expect it to be muted and down Wed-Thur providing us another down week (4 month cycle still dominant). Don't forget we also have a full moon Monday Apr 15 (often turns at new/full moons) may indicate a turn up. So far - 1 up day. Will tomorrow be another? crazy market turned again and closed 2 days up. I dunno. Looks like consolodation for a while. I think 1864 holds. If not another new high perhaps. thanks for your Blog Inlet.